Bees, butterflies and bubble gum. 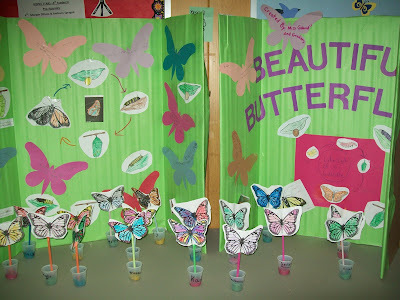 You could find displays about all that and more at the Bradford Area School District Science Fair held Friday night at Fretz Middle School. Here, you could find out "What's the Buzz" about honey bees. And here, you could learn what brand of bubble gum helps you blow the biggest bubbles. This young man looks over the project that allows people to make their own tsunami. This mom and daughter check out how methane gas is produced as items decompose. This young family learns about starfish. One of our favorites -- how to make your own speakers. One of everyone's favorites -- chocolate. A Fredonia man who crashed his vehicle in a field on April 24 then fled the scene is now facing charges. Sheriff’s deputies say they got a report of a heavily damaged car in a field in the Town of Dunkirk, and their investigation determined that the car was speeding when it spun sideways, left the road and hit a tree. The driver, 21-year-old Matthew Mulville, was taken to ECMC later that day with serious but non-life threatening injuries. On Friday, Mulville was charged with driving while intoxicated, driving while ability impaired by the combination of alcohol and drugs, leaving the scene of an accident and traffic violations. He will appear in Dunkirk Town Court at a later date. A 17-year-old boy who went AWOL from a children’s home is facing charges. Sheriff’s deputies say the boy was absent without leave on Wednesday from the Randolph children’s home and when staff members found him and attempted to approach him, he grabbed a metal sign post, waved it at them and threatened them with it. The boy was arraigned in Randolph Court on a charge of menacing and will appear in court again at a later date. A Steamburg resident is facing charges after a domestic incident early Thursday morning in the Town of Coldspring. Sheriff’s deputies charged 34-year-old Adriel Jacobs with criminal obstruction of breathing or blood circulation, a misdemeanor, after another man was taken to ECMC for treatment of a cut to his head. The victim was released from the hospital later that morning. Jacobs is free on his own recognizance and is scheduled to appear in court on May 24. Bradford City Police spent some time looking into disturbances on Leland and Jackson avenues and on Mechanic Street. They also looked into reports of harassment on South Avenue, criminal mischief on East Main Street and noise on Jefferson Street. Officers got vehicle complaints from North Kendall Avenue and West Washington Street and a report of a disabled vehicle on Jackson Avenue. They investigated motor vehicle accidents on West Washington Street and Hobson Place. Police also got a report of a barking dog on East Avenue and unspecified animal complaint from Tuna Avenue, according to the complaint report and request sheet. 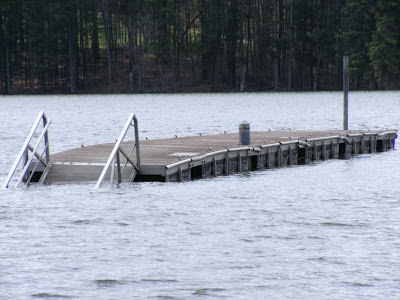 Earlier this week on the air we reported that the Onoville Marina in Cattaraugus County would not be opening this weekend because of high water. On Friday, John Stoneman sent us these pictures of the Kinzua Reservoir. You can see more of his pictures at BradfordToday.com. He, and The Olean Times Herald, report that the water level has not been this high since Hurricane Agnes in 1972. The U.S. Army Corps of Engineers says a significant increase in outflow from Kinzua Dam is planned through Sunday, and may cause substantial rises in the river below the dam. Boaters and fishermen are being advised to use caution this weekend. The Corps says the opening of the gates will be spaced over several hours so they don’t cause sudden rises in river levels. New York State & Chautauqua County officials today officially announced that the Ripley Interstate Development site has now formally been granted Shovel Ready designation by New York State. The announcement concludes a two-year process, and was made at a press conference at the site unveiling signage acknowledging the designation. New York State's Shovel Ready Certification is granted to sites deemed ready for new development and job creation. As part of the application process, each site that gets certified is reviewed to match the needs of growing industries and commercial interests. Business leaders, site selection consultants and corporate real estate executives nationwide recognize the Shovel Ready designation as a mark of excellence because they know that these pre-permitted sites will reduce construction costs and development delays, saving them time and money. The University of Pittsburgh at Bradford will play host to more than a dozen camps, gatherings, clinics and other events this summer. The camps take place in May through August and are open to the public. Ongoing through July 8 are Advanced Swimming Classes with Pitt-Bradford head swimming coach Ed Bahan. The classes are open to swimmers age 8 and older with at least two years of competitive swim experience. Swimmers can choose which weekday sessions are the most convenient to attend. Through June 10, sessions run from 3:30 to 5:30 p.m. or 4:30 to 6:30 p.m. weekdays at the Paul C. Duke Aquatic Center in the Sport and Fitness Center. Between June 13 and July 8, swimmers can choose between a 6:30 to 8:30 a.m. session and a 4:30 to 6:30 p.m. session each weekday. Northwest Savings Bank on Main Street hosted the Bradford Area Chamber of Commerce Business After Hours on Thursday. 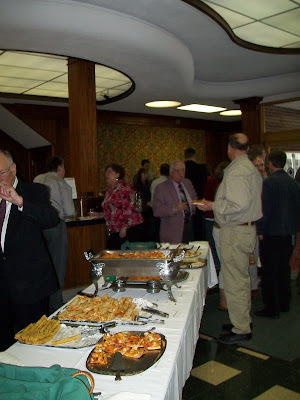 Mexican food and beverages -- in recognition of Cinco de Mayo -- were provided by the Bradford Club. People and businesses who are not Chamber members should think about joining. Cool events like this are only one of the many member benefits. Call Becky at the chamber office for more information. Ridgway/Cyclone Pa. (May 06, 2011) PENNDOT Elk/McKean County Maintenance has announced work for the week of May 09, 2011 through May 13, 2011. CRACK SEALING- SR 153, Boone Mt. Kentucky Derby, casino night, live auction, hat parade, Southern cuisine, champagne fountain … what could be better? That’s exactly what is happening Saturday night at the Derby Gala. Proceeds from this annual event, which runs from 4:30 to 8:30 p.m. at the Pennhills Club, go towards the Bradford Area Library Endowment Fund. This event is not just the horse race – there’s so much more. New this year is the casino night with “funny money” party-goers will get with the purchase of their ticket. They can then try their luck in the casino and bid on the funny money auction later in the night, including a Case knife in a display case that is valued at $400. 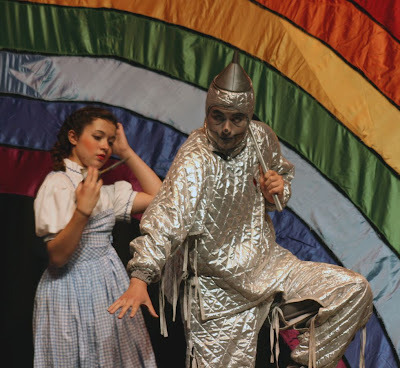 The live auction includes prized items are perfect for those who collect Zippos, Dave Hodges sculptures or, perhaps, need to get away from it all. A unique, one-of-a-kind red Zippo lighter is one of the auction items. 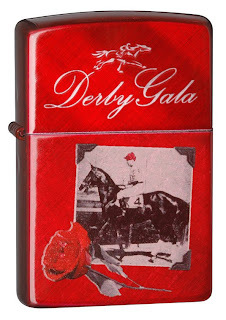 This is part of a series of collectible, unique lighters that have been made available for the Gala only. A St. Marys company is getting a loan of more than half a million dollars from the state that will allow them to expand their business and hire more people. The Pennsylvania Industrial Development Authority has approved a $574,000 15-year loan to North Central Enterprises on behalf of P/M National. The total cost of the project is $820,000 and will allow the company to complete a 28,000 square-foot building addition to increase its manufacturing and office space. P/M National manufacturers powdered metal products and will be able to retain its 16 existing employees and create an additional 10 jobs within the next three years. 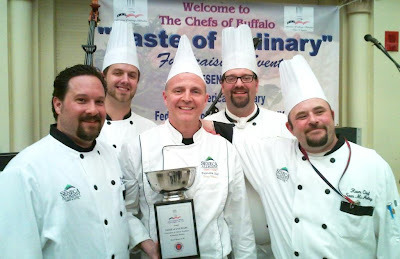 SALAMANCA, NY – The culinary team from the Seneca Allegany Casino & Hotel recently earned the “Best in Show” and “People’s Choice” awards at the American Culinary Federation (ACF) Buffalo Chapter’s fifth annual “Taste of Culinary” event, which featured 50 culinary teams throughout Western New York. ~~ Marinated Skirt Steak – grilled and served with baked polenta, balsamic caramelized onion, sweet peppers and fresh mozzarella. Proceeds supported the Chef and Child Foundation, an organization that educates children and families about proper nutrition and fights against childhood hunger, malnutrition and obesity. A day without rain (finally!) allowed city workers to get started on filling potholes. A Mayville, New York, man has pleaded guilty in federal court in Pittsburgh to making false statements to the US government. Court records say on October 22, 2010, 51-year-old Mark Juliano made a false and fraudulent representation when submitting an application for a new US passport, claiming he had lost his original passport. He faces up to 5 years in prison when he’s sentenced August 25. A former Brookville Area High School teacher has been sentenced to 5 to 10 years in state prison for having a sexual relationship with a female student. 43-year-old Karin Hetrick pleaded guilty to aggravated indecent assault for having sexual contact with a 15-year-old girl from November of 2009 to March of 2010. Court records say there were 50 occasions of touching at the school, 10 in Hetrick’s car and 10 in Hetrick’s home. Charges against three of the four people arrested in last month’s drug bust in Bradford have been bound to court. 25-year-old Leonard Holmes, also known as Phil Brooks, 26-year-old Kennedy Gadley and 27-year-old Irvin Mitchell, all of Buffalo, were charged after police searched 189 Congress Street and found about 35 grams of cocaine, along with heroin, marijuana, a handgun and $2,400 in cash. Holmes and Mitchell are jailed on $75,000. Gadley’s bail is $50,000. 18-year-old Angel Fenton of Bradford was also arrested on April 21. She is in jail on $75,000 bail, and her preliminary hearing is scheduled for May 18. An Olean man, who jumped bail on an arson charge in Allegany last October, has been arrested in Miami. The Cattaraugus County District Attorney's office says 21 year-old Gary Coleman was apprehended in Dade County and will be extradited to Cattaraugus County soon. Coleman is charged with arson and reckless endangerment in connection with the firebombing of an Allegany apartment occupied by St. Bonaventure students, on October 17. Olean resident Steven Sprague was sentenced Monday to probation. Andrew Piccirillo of Portville will be sentenced later this month. Three other people have pleaded not guilty. Charges have been filed against two St. Marys Area High School students after their senior prank resulted in all the schools in the district being locked down on Friday morning. 18-year-old Jack Reed and 18-year-old Connor Rohrback both dressed as janitors that morning, went into Elk Catholic high school and started peforming janitors’ duties. They have both been charged with criminal trespass and disorderly conduct, according to records filed in District Judge Donald Wilhelm’s office. After they were caught they said their plan was to dress as janitors and see who could last the longest inside the school without being caught. Their disguises included cleaning supplies, wigs and fake facial hair. A Bradford woman died in a house fire late Tuesday night on Lafferty Hollow in Foster Township. State police say 83-year-old Gertrude Luke was alone in the house when the fire started shortly before midnight. Seven fire companies answered the call and a report said Luke was trapped in the blaze. A state police fire marshal has determined that the blaze started in the master bedroom after an electrical malfunction in a closet. 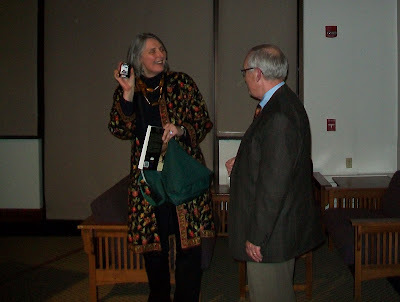 "Still Life" author Louise Penny thanks Bradford Area Chamber of Commerce Executive Director Ron Orris for the Zippo lighter he presented her with following her talk "Three Pines and Beyond" Tuesday night. Penny's visit to Bradford was the culmination of this year's One Book Bradford events. A Chautauqua County soldier has been killed in Afghanistan. US Army Sgt. Kevin White was serving in an infantry unit east of Kabul near the Pakistani border when he died on Monday after his unit was attacked by an IED. White was a 2006 graduate of Westfield Academy and Central School. UPDATE: May 5, 2011 -- Cpl. White was posthumously promoted to sergeant. An elderly Salamanca woman is facing drug charges following the latest investigation by the Southern Tier Regional Drug Task Force. Police arrested 73-year-old Catherine Pike of Washington Street and charged her with criminal sale of a controlled substance for selling her prescription pills. Police say more charges are pending. Pike is scheduled to appear in court on Friday. Police are continuing their investigation and say more arrests are expected. Foster Township supervisors are asking people who have not turned in their easement agreements for the new sewer line project, to turn them in as soon as possible. He said he and supervisors BJ Campbell and Dale Phillips will be going door-to-door to talk with people who have not turned in their agreements yet, and asked that people who have a problem call them. Township engineer Roy Pedersen noted that Al Vanderpoel, also with E&M Engineers, has worked with a few residents who had issues and those issues have been resolved. Connelly wondered – because EDUs have been shut off in the Tuna Valley – if residents will be able to use the sewer system after they pay the tap-in fee.